A 2-year-old boy had his foot amputated Saturday after he was accidentally struck by a riding lawn mower being operated by his mother, according to Pasco County authorities. Pasco County Fire Rescue claims that the mother was riding a commercial zero turn riding lawn mower at the family’s home in rural Spring Hill and saw the child running toward her. She tried to shut off the mower but was unable do so in time. As the boy approached the mower, he fell and his leg went beneath the mower, severing it between his ankle and knee. Emergency personnel responded to the home around 11 a.m. They packed the amputated leg on ice and had the boy transported to Tampa General Hospital. This is at least the second lawn mower accident in the Tampa Bay area in 27 months. In April 2013, a 2-year-old lost both legs below her knees when her father accidentally backed over her on a riding lawn mower in the family’s Palm Harbor driveway. 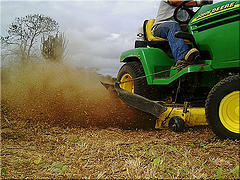 Mowing the lawn is a simple and necessary task, but a lawn mower is one of the most dangerous household tools. According to the U.S. Consumer Product Safety Commission, more than 250,000 people were treated for lawn mower injuries in 2010. Lawn mower injuries can be quite serious, including amputations, as this case shows, vision loss, and severe burns. In severe cases, lawn mower injuries can be fatal. Our Pasco County Injury Lawyers at Whittel & Melton work closely with safety experts to fully evaluate lawn mower related accidents in order to find out if the mower was defective or possibly missing an important safety feature. If you or a family member were injured while using a lawn mower, please call us at 727-847-2299 or contact us online for a free consultation.